Director Jacques Tourneur is best remembered today for such 1940s fare as Cat People, I Walked with a Zombie (starring Frances Dee, Joel McCrea’s real life wife) and one of the very best films noirs, Out of the Past (1947), with Robert Mitchum, Kirk Douglas and Jane Greer. 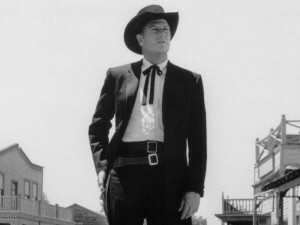 In the 1950s he made several westerns with Joel McCrea, of which the best is probably Stars in My Crown. 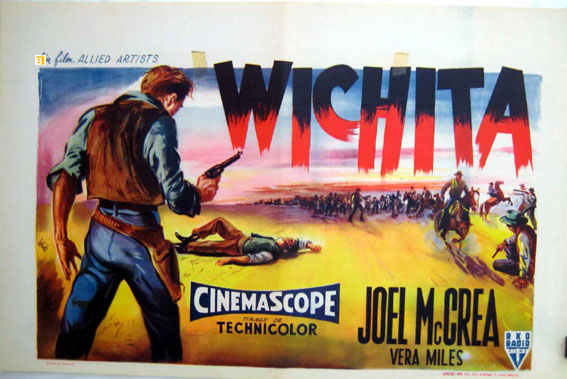 Wichita is one of those Tourneur-McCrea collaborations, a supposed retelling of the early pre-Dodge City part of Wyatt Earp’s career as a lawman. The railroad has just been brought to Wichita, Kansas, by Sam McCoy (Walter Coy). It’s starting to attract more cattle herds and those in search of new business opportunities, like young Wyatt Earp (played by not-so-young Joel McCrea). 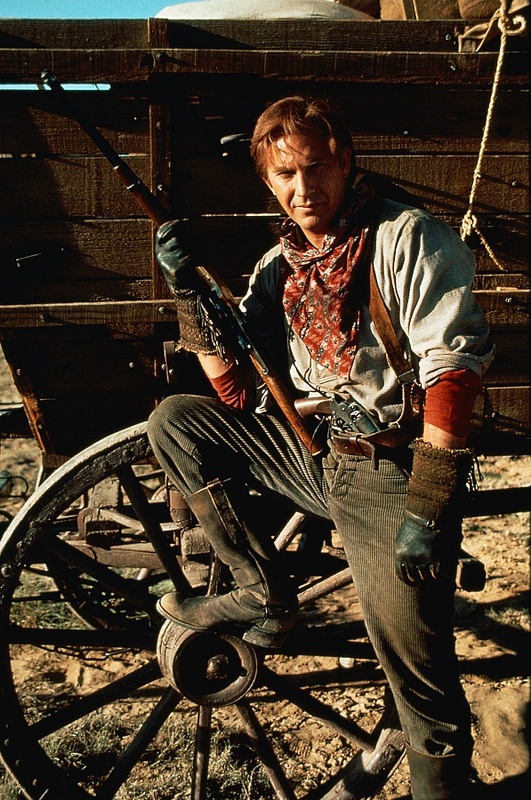 He camps overnight with one of those herds, and two of their cowboys, the Clements brothers (one played by Lloyd Bridges), try unsuccessfully to rob him while he sleeps. Foiling that, he moves on to the town, where he meets the local newspaper editor Arthur Whiteside (played as a typical heavy-drinking western newspaperman by Wallace Ford) and his young assistant Bat Masterson (Keith Larsen). His first action in town is to break up a bank robbery, getting him lots of attention from the law-and-order part of the citizenry. 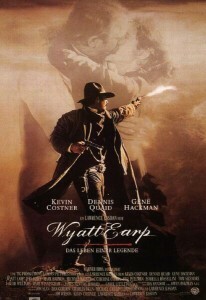 When wild cowboys shoot up the town and kill a young boy, Wyatt accepts the marshal’s badge and starts to clean things up. Not everybody is happy with that, including Sam McCoy, who’d like to see the town a little more open to promote business. McCoy’s daughter Laurie (Vera Miles) is romantically interested in Wyatt, though. 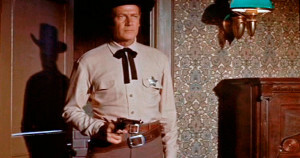 Wyatt bans the wearing of guns in town. Doc Black (Edgar Buchanan), the most corrupt of the town fathers, tries to hire a couple of slick-looking newcomers to kill Earp, but they turn out to be his brothers Morgan (Peter Graves) and James (John Smith). When Wyatt runs Doc out of town, he seeks out the Clements brothers and engineers an attack on Wyatt as he leaves the McCoy house. 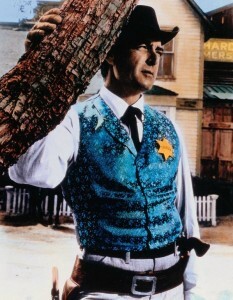 Instead of Wyatt, they kill McCoy’s wife Mary (Mae Clarke). 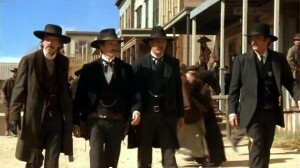 Giving chase, the Earp brothers kill one and capture another. As gunman Ben Thompson (Robert Wilke) and the rest of the cowboys are about to try to get Wyatt, they reconsider as Doc Black’s role in the killings and trying to take down Wyatt is revealed. Presumably Wyatt and Laurie can now get together, although of course that didn’t happen in real life. Laurie McCoy (Vera Miles) romances the new marshal (Joel McCrea). In general, this is a pretty typical town-taming story. Joel McCrea can play Wyatt Earp’s stern rectitude easily, but at 50 he’s too old for a young Wyatt, and too old for the lovely 27-year-old Vera Miles, who is fine but not very central to the story here. Wallace Ford is also fine as hard-drinking newspaperman Arthur Whiteside, but we’ve seen this character before—notably Edmund O’Brien in The Man Who Shot Liberty Valance (also with Vera Miles, this time romanced by the too-old James Stewart and the too-old John Wayne), and even Thomas Mitchell’s Doc Boone in Stagecoach. 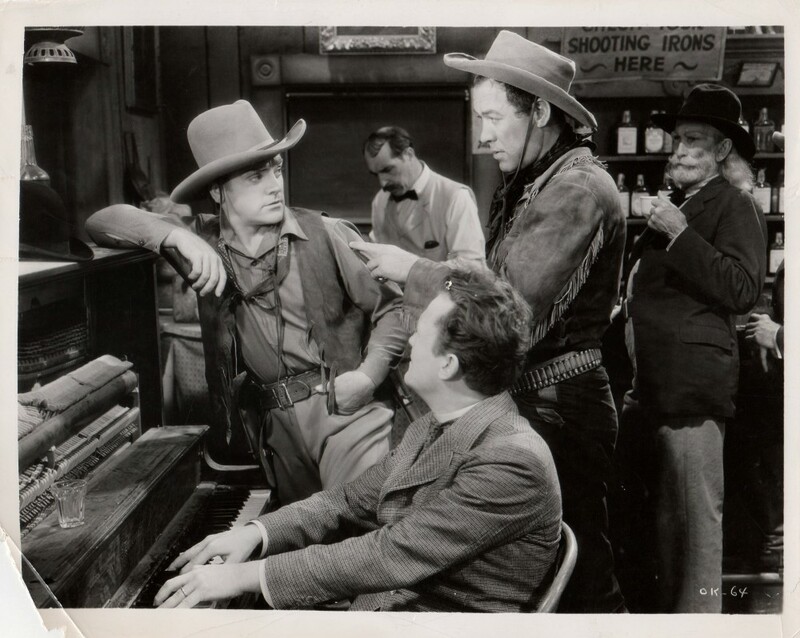 Edgar Buchanan does well as a villain, as he did in Texas (1941), with Glenn Ford and William Holden. Robert Wilke and Jack Elam appear as bad guys, and the rest of the supporting cast is good. You might even see future director Sam Peckinpah in an uncredited appearance as a bank teller. 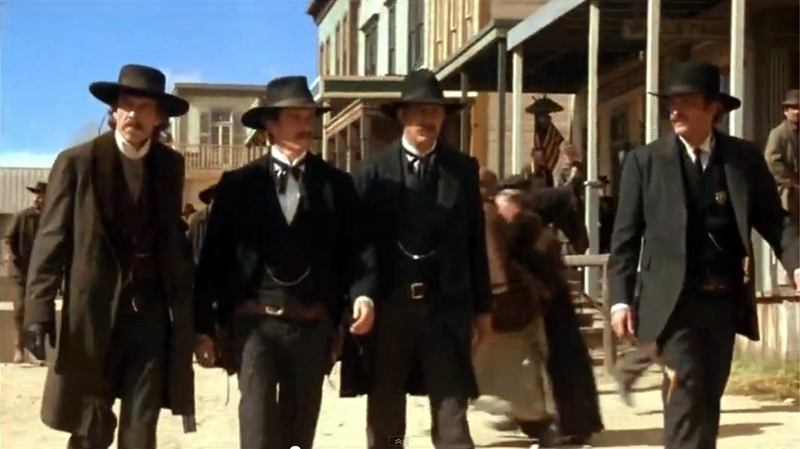 So how do these goings-on relate to the actual Wyatt Earp and Bat Masterson? In real life, Wyatt Earp’s first law enforcement job was for a year in Wichita in the late 1870s, where he was deputy sheriff, not the main man. He was 28 at the time. 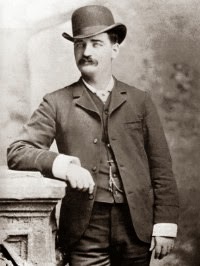 Although Bat Masterson finished his career as a New York sportswriter, at this early stage he’d met Wyatt Earp when they were both hunting buffalo. Wyatt didn’t take up any long-term romantic relationships in Wichita. His brother James never did much in the law enforcement business, unlike Morgan and especially Virgil. All in all, this isn’t very accurate historically. 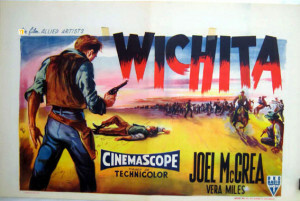 But it is worth watching, if not the most memorable of Joel McCrea’s westerns. 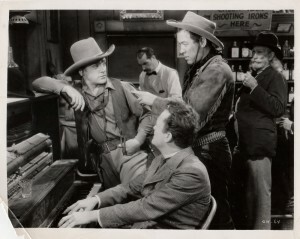 McCrea was a good actor, and in the late 1930s and early 1940s was a bigger star than John Wayne. Like Gary Cooper, even if he’s too old for the role, he’s watchable. 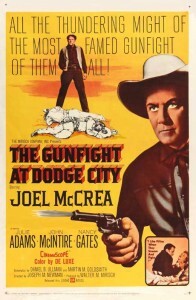 This movie makes him the only star to play both Wyatt Earp and Bat Masterson (The Gunfight at Dodge City, 1959). 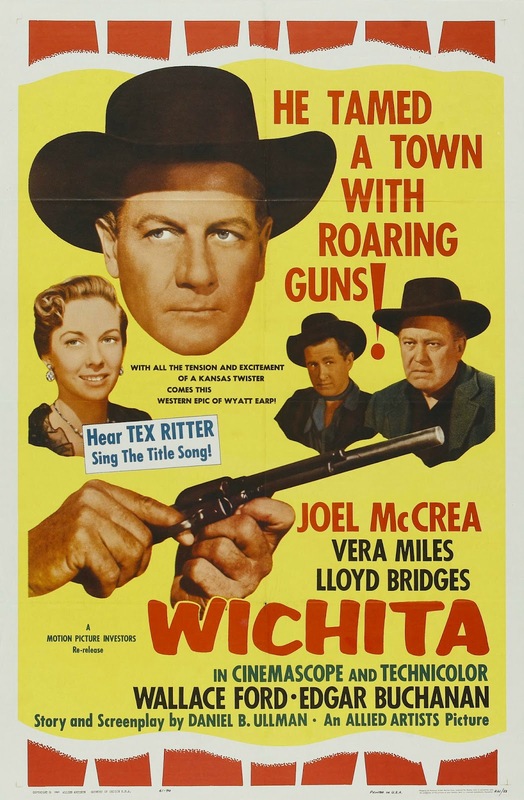 The title song, sung by Tex Ritter, is forgettable. Shot in color, at 81 minutes. 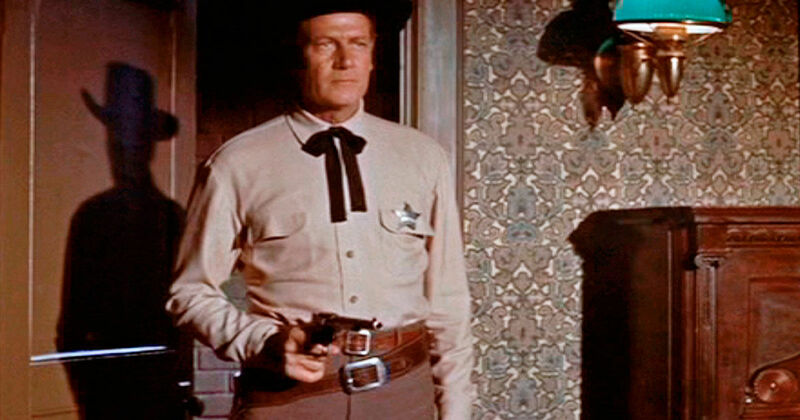 This entry was posted in Westerns Worth Watching and tagged Bat Masterson, Jacques Tourneur, Joel McCrea, Town Taming, Wyatt Earp on September 2, 2015 by Nicholas Chennault. 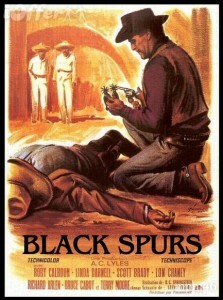 The black spurs of the title belong to an outlaw called El Pescadore (The Fisherman with an extra “e”), who robs a bank in the movie’s first scene. Santee, a cowhand with ambitions, takes up his pursuit as a more lucrative line of work, and appropriates the black spurs when he gets his man. 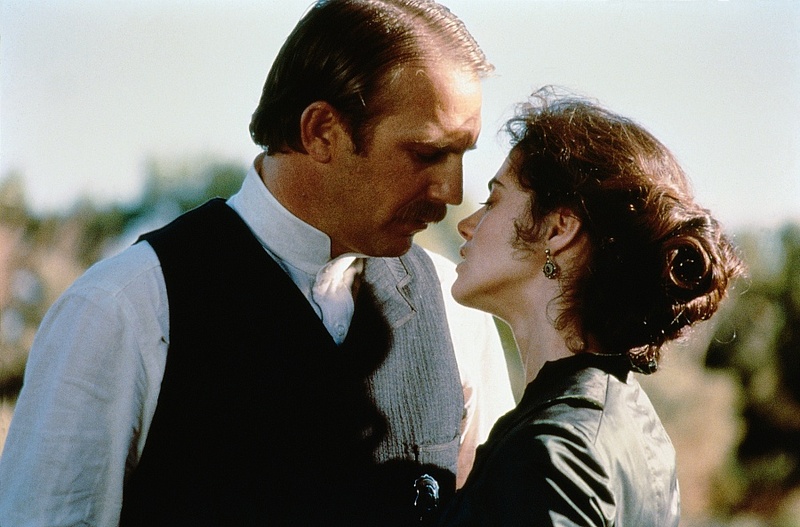 Returning to his town in Texas in 1885, he finds that his girlfriend has married a sheriff from Laredo and moved on. Eventually, Santee comes up with an idea to make his fortune in Kile, Kansas. The railroad will come through Kile or Lark, but the railroad company avoids disorderly towns when making those decisions (historically, then they become disorderly after the railroad has arrived). 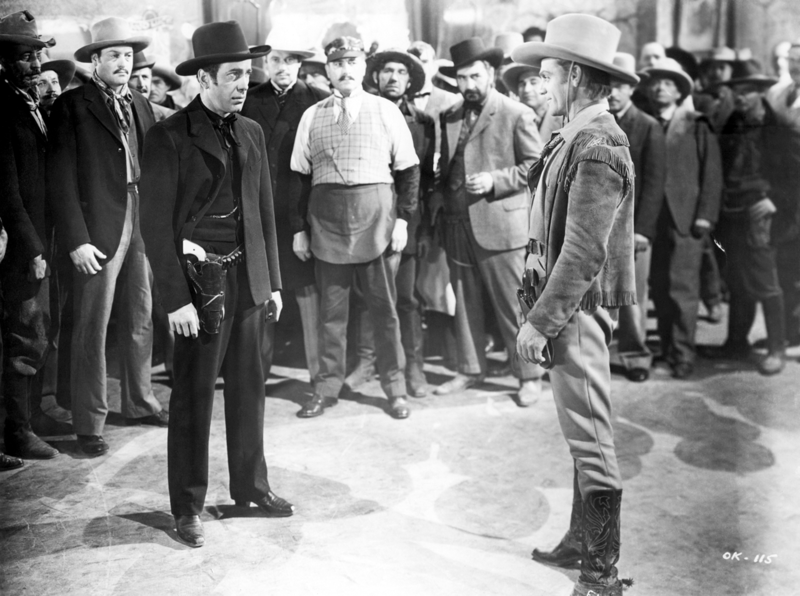 Santee makes a deal with Gus Kile (Lon Chaney, Jr.) to open up Lark, causing the railroad to avoid Lark and go through KIle. 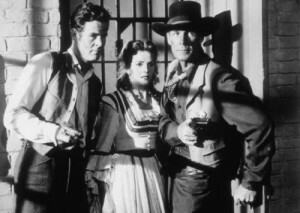 He brings in more gamblers, gunmen (Bruce Cabot) and women (led by Linda Darnell), and backs off Sheriff Henry Elkins (James Best), now married to Santee’s former girl Anna (Terry Moore). 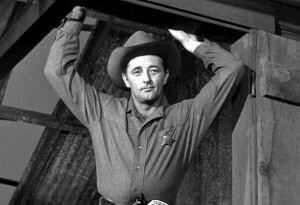 Santee is unable to completely control some of his men, who tar and feather Sheriff Elkins. Anna reveals that her son is Santee’s, and that she had to marry Elkins to become respectable while he was out hunting El Pescatore. 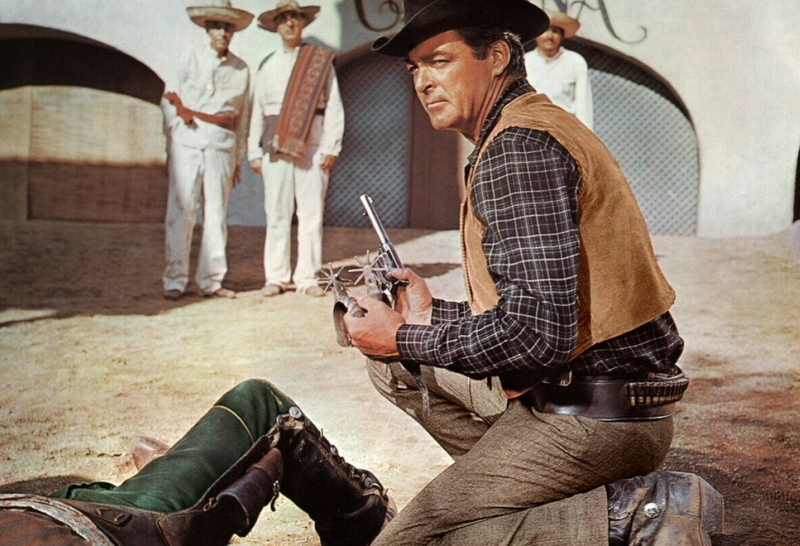 Santee (Rory Calhoun) wins his spurs (black ones). This low-budget feature was late in the careers of Rory Calhoun (starting to get a little gray in his hair), Linda Darnell (still beautiful but thickening a bit), Bruce Cabot, who had been playing similar bad guy roles thirty years (Last of the Mohicans, Dodge City) and twenty years (Angel and the Bad Man) previously, and Lon Chaney, Jr. For Calhoun, this and Apache Uprising (also 1965, also directed by R.G. 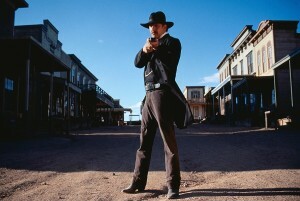 Springsteen) were his last significant western movies. It was Darnell’s last movie; she died tragically in a fire the same year at the age of 41 after 25 years in the movies. Director R.G. 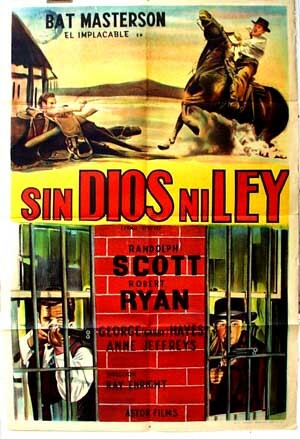 Springsteen was nearing the end of his movie career as well, with several low-budget westerns produced by A.C. Lyles. This is not among the best of Calhoun’s westerns, but it’s not the worst, either. 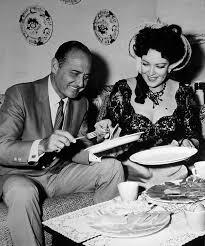 Santee (Rory Calhoun) puts on the badge; co-star Linda Darnell behind the scenes with producer A.C. Lyles. 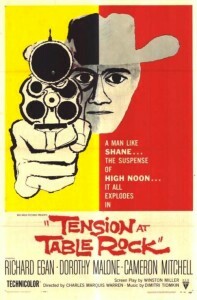 In the 1960s, A.C. Lyles produced a series of thirteen low-budget westerns for Paramount, of which this was the fourth. One of the ways the budget was kept down was to use journeyman directors (like Springsteen) and to use stars with recognizeable names but who were past their primes–like those in this film. Silent screen star Richard Arlen was in several of them, including in this as a hard-bitten saloon owner. Shot in color at Ray Corrigan’s ranch in Simi Valley, California, at 81 minutes. 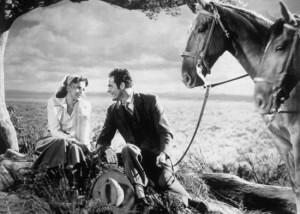 For better Rory Calhoun, see Dawn at Socorro or Apache Territory. For better Linda Darnell in a western (and her role here as Santee’s imported madam from New Orleans is quite minor, although she received major billing with Calhoun), see The Mark of Zorro, My Darling Clementine and Two Flags West, all from the 1940s. 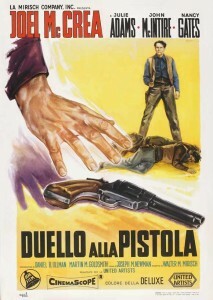 For another bounty hunter named Santee, see Glenn Ford in Santee (1973)—not one of his better westerns, either. This entry was posted in More Westerns and tagged Bounty Hunters, Rory Calhoun, Town Taming on July 2, 2015 by Nicholas Chennault. 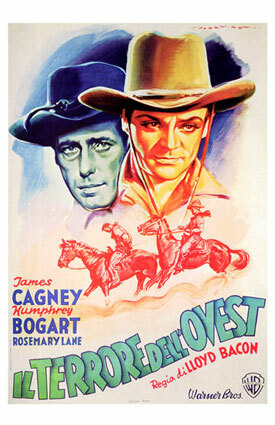 The most obvious feature of this western from 1937 is that the two best-known actors in it have the most urban personas of any from the 20th century. That’s perhaps one reason why James Cagney and Humphrey Bogart didn’t make many westerns. They don’t sound all that authentic in a western, either. Cagney plays the outlaw of the title, the Oklahoma Kid. It is 1893, the eve of the famous Oklahoma land rush into the Cherokee Strip (the largest land run in U.S. history). 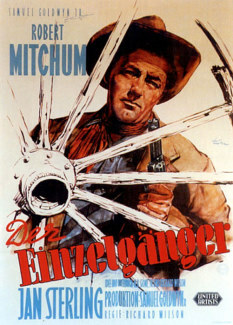 There were several Oklahoma land rushes, the most famous in 1889 and 1893, featured in Tumbleweeds (1925, William S. Hart’s last film), Cimarron (both 1931 and 1960 versions) and Far and Away (1992), among other movies. 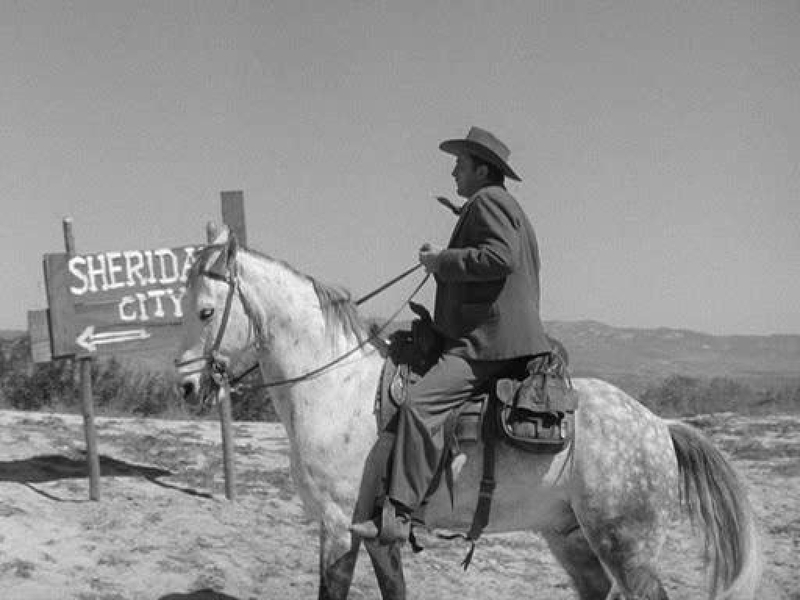 The land to be opened to settlers this time has been bought from the Indians for a pittance, but even that pittance is robbed from a stagecoach by the evil Whip McCord (Humphrey Bogart) and his gang. However, it is also stolen from them by… the Oklahoma Kid. McCord sees to it that the original crime is attributed to the Kid, instead of to his own gang. 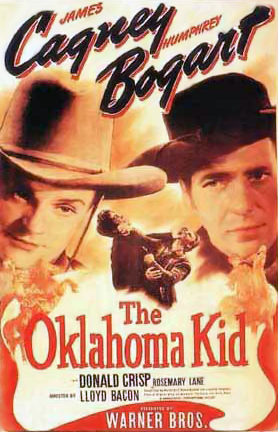 Wes Handley (Ward Bond) is inclined to take on the Oklahoma Kid (James Cagney) over his choice of music. Meanwhile, law-abiding folk are planning to set up the town that will become Tulsa. The Kincaids, father John (Hugh Sothern) and son Ned (Harvey Stephens), will ride their fastest horses and claim the site. Judge Hardwick (Donald Crisp) and daughter Jane (Rosemary Lane) will come along shortly after, with law and civilization. 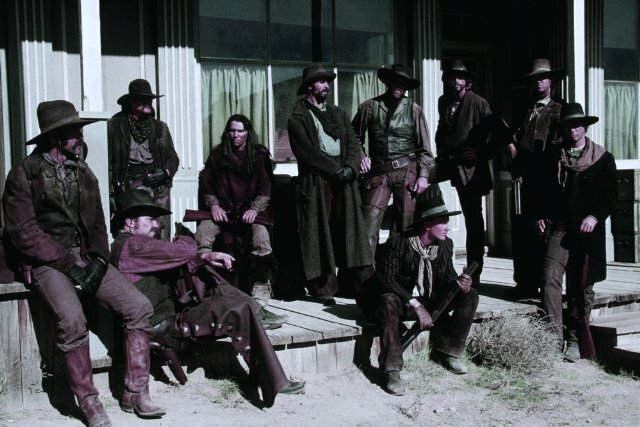 However, McCord and his men are Sooners, sneaking across to the land the night before the gun goes off, and they claim the Kincaid’s site first. The Kincaids strike a deal: they get the town site they want, but have to agree that McCord gets exclusive rights to saloons, booze and gambling. That sets up a conflict between the forces of law (regular folks) and chaos (McCord). When there’s talk of setting up a vigilance committee, McCord frames John Kincaid for a murder. It turns out that the Oklahoma Kid is Jim Kincaid, John’s wild son, and he comes back to help the old man. He brings back Judge Harwick to hear the case, but he’s too late, and a venal hack judge has sentenced John to hang. John refuses to be busted out of jail, though, and, as Ned, now the local sheriff, pursues the Kid, McCord whips a mob into a fury. By the time Ned and the Kid get back to town, their father is dead. 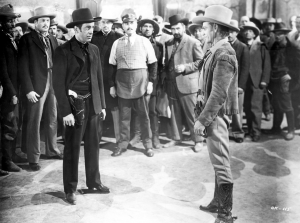 Whip McCord (Humphrey Bogart) and the Kid (James Cagney) come to an impasse. This had a bigger budget than most 1930s westerns, as we can tell from the top-flight stars and main-line director. 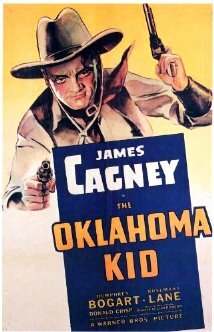 Cagney’s particular form of screen energy dominates the movie, making the Kid seem kind of a pre-gangster of the plains. Cagney was a bigger star than Bogart at this stage of Bogart’s career. Cagney and Bogart didn’t get along well on the set, much as their characters didn’t, although they went on to make Angels with Dirty Faces (1938) and The Roaring Twenties (1939) together—gangster movies, for which they seem much better suited. 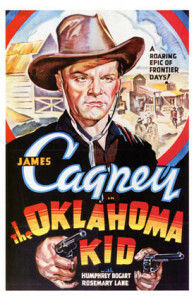 Cagney made two more westerns in the 1950s as his career was coming to a close: Run for Cover (1955), and Tribute to a Bad Man (1956). Bogart made at least one more; he shows up as a Mexican bandit chieftain in Virginia City (1940). 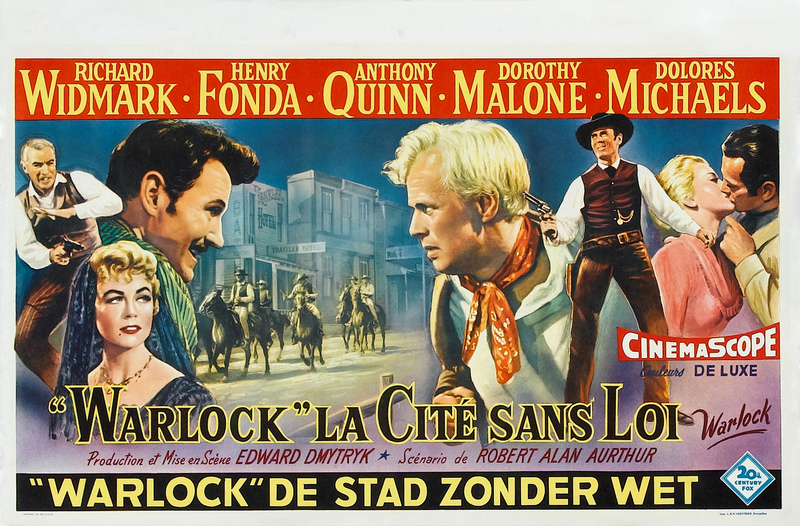 This film is surprisingly watchable, considering the apparent unsuitability of the casting and the fact that it’s from an era when westerns were generally made very cheaply and had little cinematic prestige. 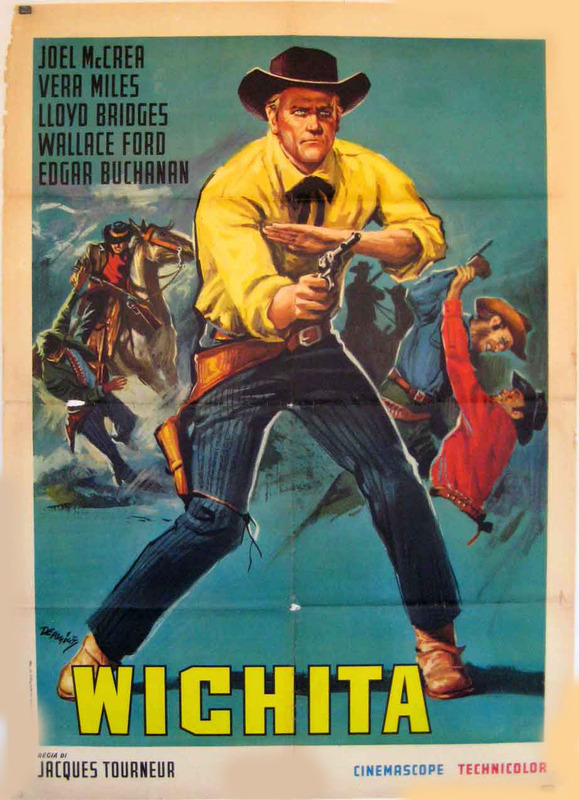 Director Lloyd Bacon was versatile (his work includes 42nd Street and other musicals with Busby Berkeley as choreographer and Knute Rockne, All American), but he didn’t make many westerns. According to Cagney, Bacon wasn’t the director originally slated to direct. Music is by Max Steiner; cinematography is by the legendary James Wong Howe. Shot on the Iverson Ranch in Chatsworth, California. In black and white, at 81 minutes. This entry was posted in Westerns Worth Watching and tagged Humphrey Bogart, James Cagney, Outlaw Gangs, Town Taming, Ward Bond on March 23, 2015 by Nicholas Chennault. The lawless streets in question are in the town of Medicine Bend. Calem Ware (Randolph Scott) has been brought in as marshal by large rancher Asaph Dean (James Bell), founder of the town of Medicine Bend. 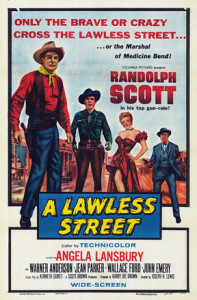 (See Randolph Scott in another Medicine Bend the next year, in Shoot-Out at Medicine Bend.) Ware is good with a gun and demonstrates that he doesn’t mind using it, but he seems a bit haunted by something. When Dingo Brion tries to kill him as he’s getting a shave, he finds five $20-dollar gold pieces in Dingo’s pocket, meaning that somebody’s paying to get Ware killed. There is little hiding that one of the prime candidates as this paymaster is saloon owner Cody Clark (John Emery), who thinks he’d do better business in a more open town. His silent partner is businessman Hamer Thorne (Warner Anderson), who similarly hopes to prosper when a mining boom hits. The sleazy Thorne has been carrying on an affair with Dean’s wife Cora (Jean Parker), but plans to throw her over for Tally Dickinson (Angela Lansbury), a stage performer he’s just brought into town. 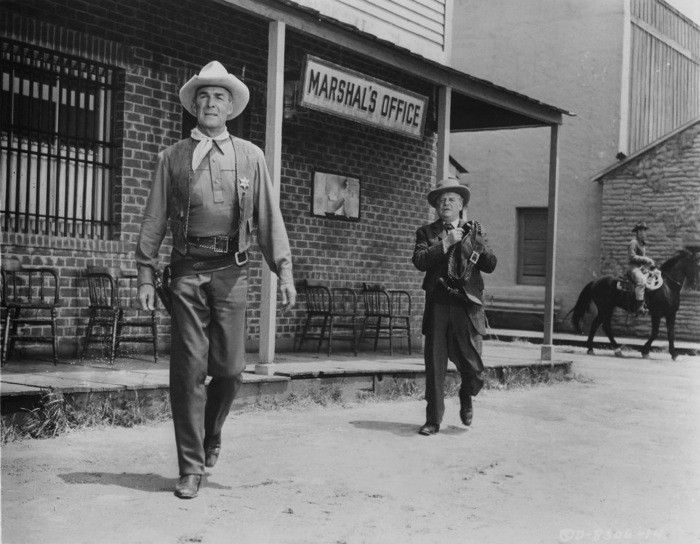 Marshal Calem Ware (Randolph Scott) and Doc Wyatt (Wallace Ford) head toward trouble. However, Tally is still married to Calem Ware, although they haven’t been together in eight years. When he was the marshal in Apache Wells, she couldn’t take worrying about the violence of his profession. When they meet again, it seems they still have feelings for each other, but neither changes the attitudes that drove them apart. Thorne and Cody bring in a gunfighter with a special enmity for Ware, Harley Bascomb (the saturnine Michael Pate). Intrigued by the high price they’re offering, Bascomb demands a third of their operation. Unaware that Ware has injured his gun hand in a fight, Bascomb calls him out and creases his skull when Ware can’t handle his gun as well as usual. 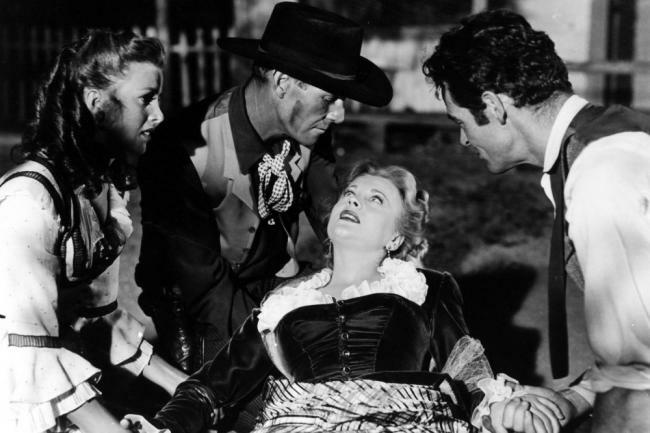 As Ware falls, his friend Doc Amos Wyatt (Wallace Ford) pronounces him dead and removes the body to where he can recuperate in private while everybody thinks he’s dead. Meanwhile, the town blows wide open, and Thorne and Cody challenge Dean. Seeing what’s happening, both Tally and Dean’s wife desert Thorne. When Ware recuperates enough, he has it out with Bascomb again, this time winning by a stratagem. As Thorne and Cody prepare to leave town, Thorne kills Cody thinking he’s Ware, and Ware captures Thorne. Turning both Thorne and his marshal’s badge over to the newly-invigorated forces of good in the town, Ware heads off to his ranch with Tally, leaving his career as a marshal in Medicine Bend and giving his gun to Doc Wyatt. 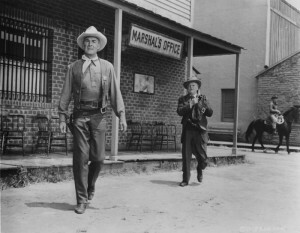 The second time, Ware (Randolph Scott), bad hand and all, gets gunman Harley Bascomb (Michael Pate). This is a fairly complicated plot for a movie of only 78 minutes, with lots of coming and going. 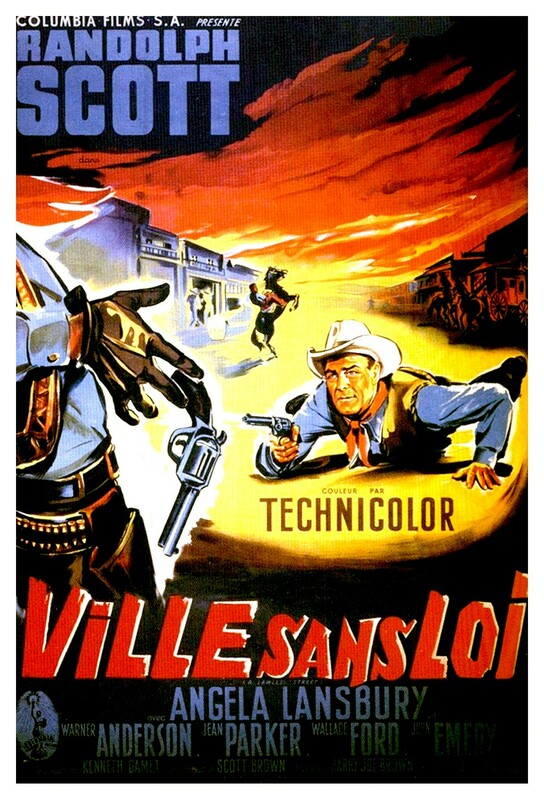 Scott seems a little too sunny of disposition for a man who kills several people in the course of the film and has several large-scale personal problems. Angela Lansbury is a step up from the usual female lead in a Scott movie, but there doesn’t seem to be a lot of actual chemistry between them. Still, this is a better-than-average Scott western from the early 1950s, made just about the time he was starting his association with Budd Boetticher. 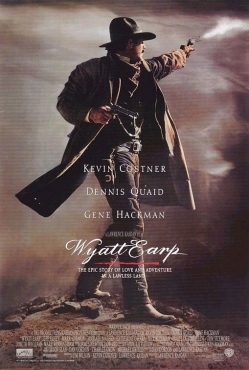 Screenplay by Kenneth Gamet, who wrote eight Scott westerns in all. In color. 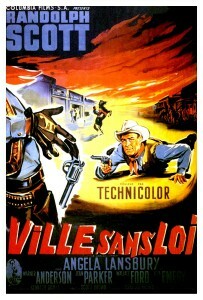 This entry was posted in Westerns Worth Watching and tagged Randolph Scott, Town Taming on December 10, 2014 by Nicholas Chennault. This excellent psychological western feels overstuffed, with a little too much plot and more good actors than it quite knows what to do with. 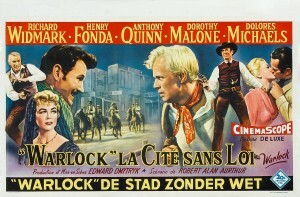 It has two competing town tamers, one legitimate and the other less so, a Doc Holliday-character with a spotted history, a scarlet woman (often really dressed in scarlet), a wealthy if inexperienced young mining heiress, and a Clanton-esque gang of cowboy-outlaws, all coming together in one town where the law is not working. 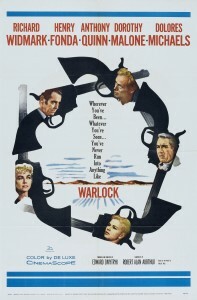 Warlock is a mining and ranching town in Utah, but so remote that the county sheriff seldom makes an appearance. 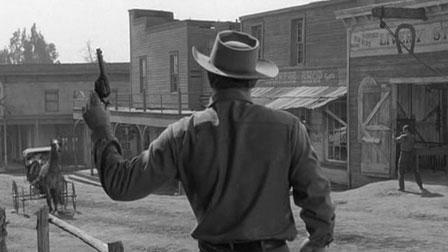 There is a town marshal of sorts, but the opening scene shows him getting run out of town by Abe McQuown (McEwen? McCune? 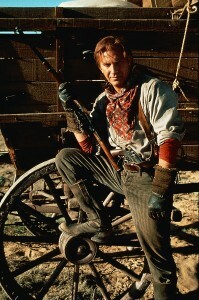 Played by Tom Drake), head of the San Pablo ranching crowd. 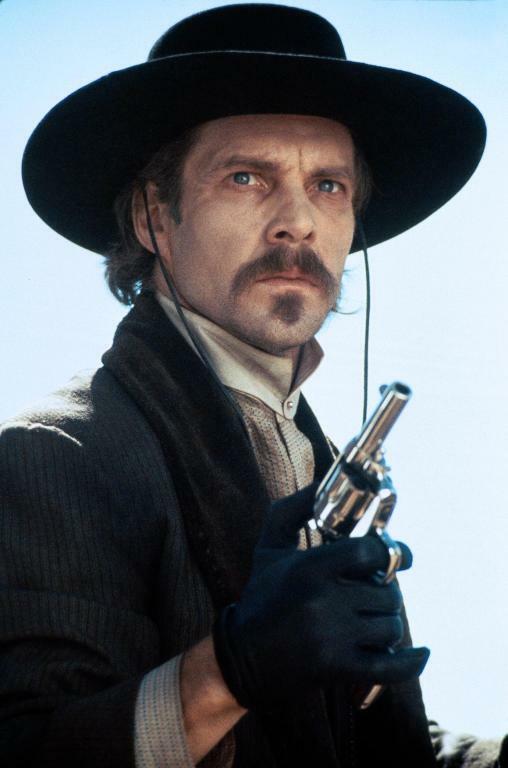 He’s presumably a rancher, but of the Ike Clanton sort—given to various forms of crime (rustling, stage robbery) and intimidation of the town. 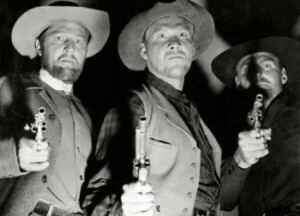 His men, including Johnny Gannon (Richard Widmark), his brother Billy (Frank Gorshin, uncredited) and Curley Burne (DeForest Kelley), appear to be a bunch of thugs and back-shooters. 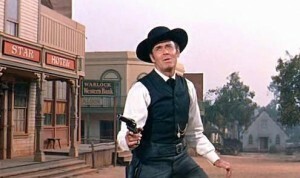 The local citizens send for gunman Clay Blaisdell (Henry Fonda) from Fort James, a sort of marshal-for-hire. 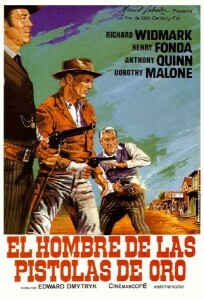 He brings with him Tom Morgan (Anthony Quinn), a gambler-gunman with a clubfoot, who sets up his own saloon-casino (calling it “The French Palace,” a sign they have brought with them) and who keeps off the backshooters. Blaisdell has pleasant manners but few illusions about the cycle of civic support and distaste he can expect. “I’m a simple man, handy with Colts,” of which he has a gold-handled pair that he only uses for Sunday best. He gets paid a lot for his skills ($400 a month), but he expects his sojourn in Warlock will be brief. The citizenry will soon have second thoughts about the gunman they have brought in to impose law in their town. Blaisdell wastes no time in confronting the San Pablo gang, which he initially does effectively but without bloodshed. Johnny Gannon appears to be having second thoughts about his participation in the San Pablo gang as well. 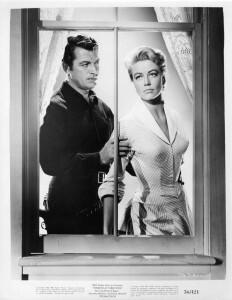 Lily Dollar (Dorothy Malone), a former saloon girl with a past relationship with Morgan, shows up. She was bringing a brother of Ben Nicholson, whom Blaisdell had once killed. She seems to be trying to get back at Morgan, and thinks killing Blaisdell may be the quickest way to do that. However, the brother is killed by Tom Morgan with a rifle during an attempted stage holdup by the San Pablo gang. Two of the San Pablo men (including brother Billy Gannon) are arrested and Blaisdell saves them from being lynched. They are ultimately let go in a legal proceeding in the county seat, Bright City, by a jury intimidated by McQuown. The distant sheriff visits, doesn’t like Blaisdell’s presence, and points out to the crowd that none of them will take the deputy sheriff’s job. But Johnny Gannon does, which sets his new authority in potential opposition to Blaisdell’s. Meanwhile, Blaisdell quickly develops a relationship with young mining heiress Jessie Marlow (Dolores Michaels) and begins to think about marrying her and putting down roots. 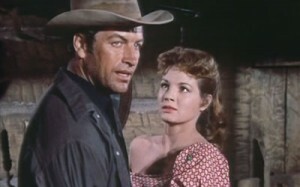 Johnny Gannon forms a relationship with Lily Dollar. Tom Morgan would prefer that neither of these happen; he wants Blaisdell to think of moving on to the next town, Porfiry City. Blaisdell has posted the San Pablo gang, meaning that they can’t enter town without an armed confrontation with Blaisdell. Brother Billy Gannon and another come into town in defiance of that posting. Gannon tells Billy, “I ain’t backin’ him, because you’re my brother, and I ain’t backin’ you, because you’re wrong.” Blaisdell, with a slight deference to Gannon, tries not to kill Billy but is left with no choice. Gannon, thinking to avoid further such bloodshed, goes to the San Pablo ranch to dissuade them from coming to town. 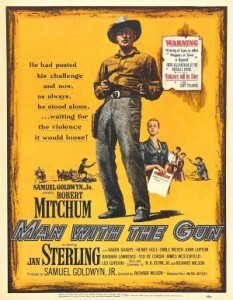 They beat him up, and Abe McQuown puts a knife through his right (gun) hand. When the gang comes in force, Lily begs Blaisdell to help Gannon. He’s willing, but Gannon insists that it’s his duty alone. 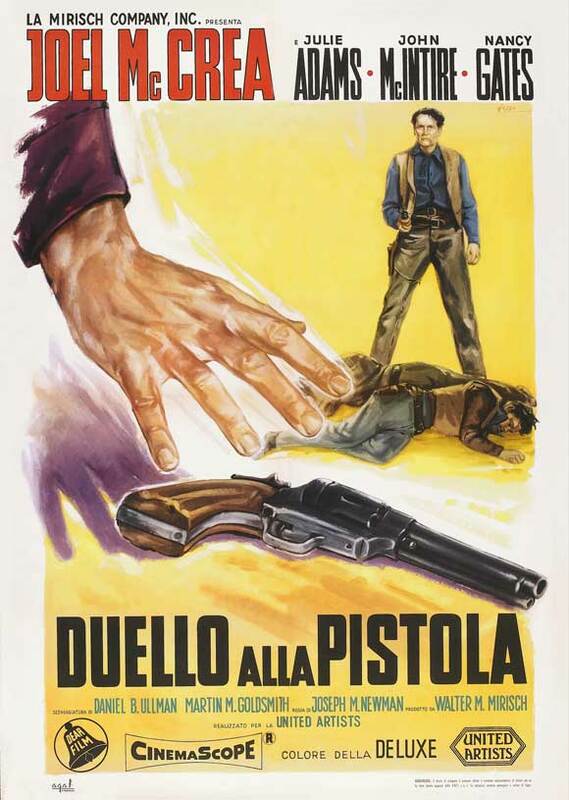 He tries to help anyway, but Tom Morgan holds him out with a gun, revealing the truth about the Nicholson brothers and their deaths. When Gannon confronts the gang, one of them, Curly, unexpectedly keeps off the backshooters and the wounded Gannon is even more unexpectedly successful with the help of a few of the townsfolk. But he’s not done. Tom Morgan doesn’t like the way things have gone, with Gannon having become the local hero, and has been drinking heavily. He tries to push Gannon into a shootout. Blaisdell intervenes now, locking Gannon in one of his own cells and killing Morgan, going slightly crazy. Gannon then orders Blaisdell out of town, and Blaisdell says he won’t go, setting up yet another confrontation the next morning. As Blaisdell walks down the street the next morning, he’s wearing the gold-handled Colts. Gannon’s wounded hand doesn’t work very well, and Blaisdell outdraws him easily with his right hand. Then he throws the gun in the dirt. 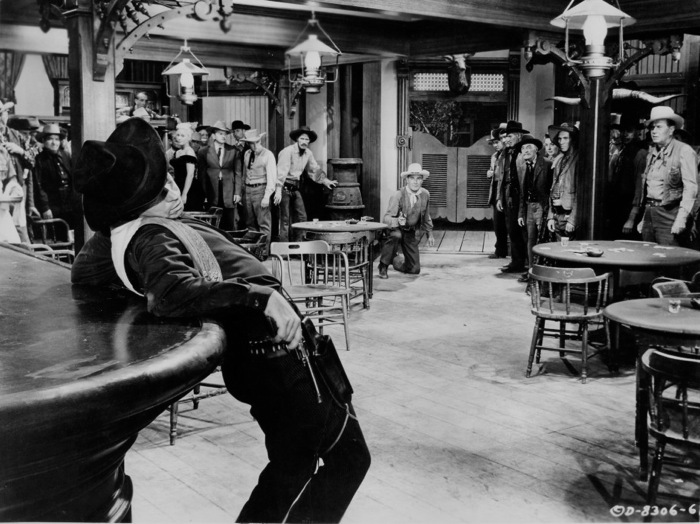 He outdraws him again with his left hand, and throws that Colt in the dirt, too. He gets on his horse and rides out of town, seemingly leaving Jessie behind. This is black-listed director Edward Dmytryk’s best western, and it put him back in the directing mainstream. 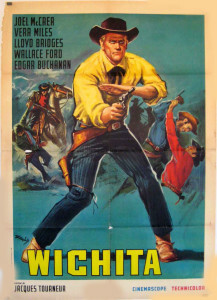 Richard Widmark has top billing, but Henry Fonda has the dominant character. Anthony Quinn is excellent, and so is Dorothy Malone. Tom Drake and DeForest Kelley are both very good in smaller roles. Dolores Michaels is adequate but mostly forgettable. 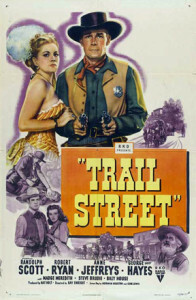 Based on a very good novel by Oakley Hall, the story brings with it echoes of the Wyatt Earp story and of Fonda as mentor to an inexperienced lawman, as in Anthony Mann’s The Tin Star two years previously. It has a memorably articulate screenplay by Robert Alan Aurthur. Leigh Harline, who had won Academy Awards for Pinocchio (1940) and done the music for Broken Lance, among many others, provided an excellent score. Shot in color around Moab, Utah, and on the 20th Century Fox lot. 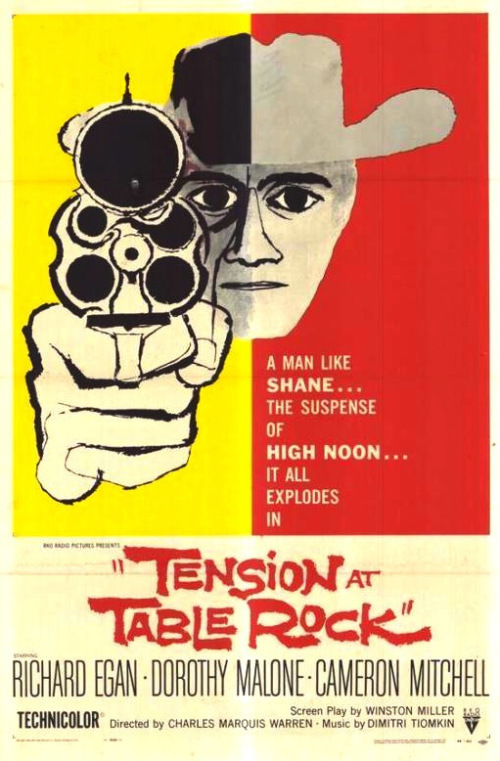 This is another of those 1950s westerns that makes a point about about how townspeople are uneasy with those they hire to enforce the law and with the violence used to do it (e.g., High Noon, The Tin Star). But it has a lot of other things going on, too. It moves right along and could probably have been a bit longer, to wrap up some of the plot’s loose ends. 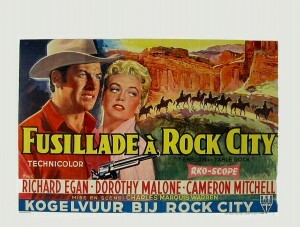 Dorothy Malone was in several good westerns, from Colorado Territory to Quantez to The Last Sunset. DeForest Kelly showed up as a gang member in other films, like The Law and Jake Wade and Tension at Table Rock, and this is one of his best. Richard Widmark and Henry Fonda were at the peaks of their careers in westerns, although they would continue to make more through the 1960s, with Fonda moving into a couple of memorable spaghetti westerns (Once Upon a Time in the West, My Name is Nobody) around 1970. Anthony Quinn, who was always good in westerns (The Ride Back, Man from Del Rio, Last Train from Gun Hill), did not make many more, moving more into ethnic roles in big movies (The Guns of Navarone, Zorba the Greek, Lawrence of Arabia). Silent film star Richard Arlen has a small supporting role. 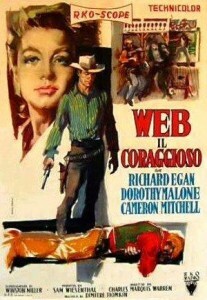 This entry was posted in Westerns Worth Watching and tagged Anthony Quinn, Dorothy Malone, Edward Dmytryk, Henry Fonda, Richard Widmark, Town Taming on April 2, 2014 by Nicholas Chennault.